In the post editor page, there is a box on the right called “Page Attributes“. 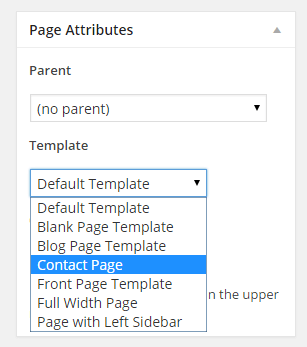 From this box, you can select multiple page templates. Select “Contact Page” template and save the page. By default, contact page’s email address is set to your admin email address. You can change that from Dashboard ->Appearance->Customize -> Post & Page -> Contact page Settings and write your mail address in “Contact Page Email Address” field and save. By default, contact page’s email is set to your WordPress admin email address. How To Setup Map in Contact Page? Select What’s here? Under the search box, an info card with coordinates will appear. How To Change The Map Bubble Text of Contact Page? How To Show Sidebar on Contact Page?